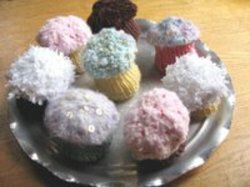 Loom Lady has a pattern for a loom knitted cupcake. I haven't loom knitted since I was a kid and was surprised to find it back in fashion. It is something I might explore when I have a little more time. More Bacon and Egg fryup goodies. Mkcarroll has a pattern to crochet one. 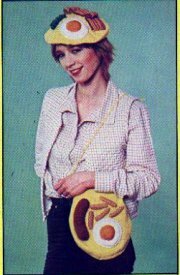 I have realised that the link I published, to the bacon and egg fry up pattern originally published in The Jackie Annual in 1979, does not work all the time. It might be permanently down, I am not sure. I thought it might be helpful to anyone landing here looking for it if I provided the pattern myself. I've also installed various ways that you can subscribe to this site. Bitter Sweet has some amazing knitted Oreo cookies, or biscuits as we call them in the UK. 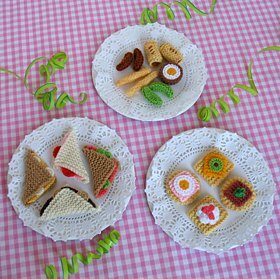 There are lots of lovely knitted things there, even a pattern for a slice of birthday cake. 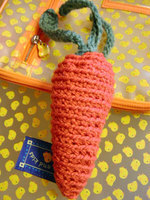 Not knitted, but a Crochet carrot. I was looking for an image to decorate a recipe with and stumbled across this. Oh wow, a slapstick knit. Knit your own custard pie. Crumpart has very kindly posted the pattern.